Astana lived up to their status as the overwhelming favourites in the Tour of Almaty when Alexey Lutsenko rode to a second consecutive win for the Kazakh team. After solid preparation from teammates Fabio Aru and Andrey Zeits, the Kazakh made a strong solo attack and never saw his rivals again before Aru beat Pavel Kochetkov (Katusha) in the sprint for second to make it a 1-2 for Astana. The Tour of Almaty may not be the biggest race on the UCI calendar but as the most important race in Kazakhstan, it plays a key role for Astana. This year the team had even asked Fabio Aru and Paolo Tiralongo to skip the Tour of Lombardy to represent their team in the Kazakh race. Astana clearly had the strongest team in the race and they came out of the race with the dream result as local hero Alexey Lutsenko defended the title after a splendid solo performance. To make things even better, their international star Aru finished on the podium in second. The race was held on a 31km circuit in the city of Almaty that the riders would cover for a total distance of 186km and despite the lack of elevation differences, it turned out to be a selective affair. After an attacking start, a 16-rider group was formed and they entered the final 40km with an advantage of 1.10 over a small chase group and 8 minutes over the peloton. 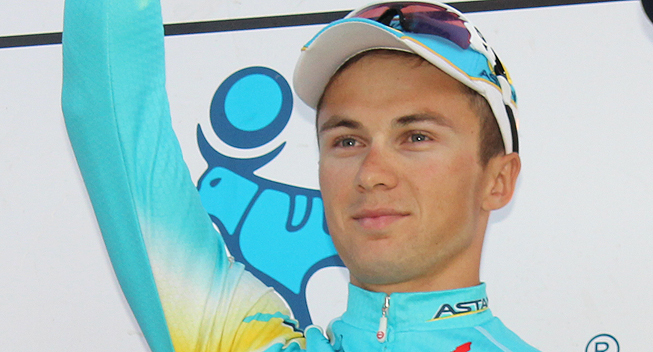 Astana had Lutsenko, Aru and Andrey Zeits in the group and they were joined by Pavel Kochetkov, Viacheslav Kuznetsov (Katusha), Sergey Firsanov, Sergey Nikolaev, Ivan Savitskiy (Rusvelo), Markus Eibegger, Matej Mugerli (Synergy Baku), Daniel Turek (Cycling Academy), Remy Di Gregorio, Yoann Paillot (Marseille), Mirko Tecchio (Uniero), Nikita Stalnov and Matvey Nikitin (Kazakhstan) in the group. Zeits and Aru were sharing the work on the front and it was clear that those 16 riders were going to decide the race. Di Gregorio fell off the pace and later Paillot and Nikitin briefly got distanced. However, they would rejoin the group as they started the final lap of the circuit, with Zeits leading Stalnov and Aru across the line. With 28km to go, Zeits and Aru briefly stopped their work and this created a bit of confusion in the group. Three kilometres later, the attacking started when one of the Synergy riders made a move but that proved to be a bad decision. Lutsenko who had been protected by his teammates until that point, made an immediate counterattack and rode away from the rest. While he increased his advantage, the attacking continued in the chase group as a five-rider group with Firsanov, Kochetkov, Pailoot, Tecchio and Aru was formed. The chase group came back together and after a few more attacks that were closely marked by Aru, Rusvelo and Katusha tried to organize a chase with Kuznetsov, Nikolaev and Savitskiy. However, the gap had already gone out to 35 seconds with 20km to go. With 18km to go, the gap was 40 seconds and Kochetkov again tried to attack. He was joined by Firsanov and Zeits but as there was little cooperation, the group again came back together. Kuznetsov, Nikolaev and Savitskiy were chasing hard but as they entered the final 10km to go, the gap had gone out to 55 seconds. As the trio started to tire, Zeits even hit the front which clearly proved that no one was going to see Lutsenko again. While Lutsenko had gone into TT mode, the chasers started to ride for second place and it was Savtskiy, Stalnov and Zeits who escaped with 4km to go. Mugerli, Eibegger, Aru, Firsanov, Kochetkov and Tecchio made it back and Savitskiy again started to ride on the front. Lutsenko had plenty of time to celebrate his win as he had extended his advantage to 1.00 while Aru, Kochetkov and Firsanov managed to escape in the finale. The trio sprinted for second and it was Aru who made it a 1-2 for Astana while Kochetkov took third before Tecchio rolled across the line in fourth. Aru and Lutsenko will now travel to Abu Dhabi for the inaugural Abu Dhabi Tour while many of the continental riders will either end their season or travel to China for the autumn races in the big Asian country.